The Let's Drive Electric, Omaha! event was a big success with over 135 participants, 22 electric vehicles on display including 3 electric-assisted bicycles, and over 90 people attending the indoor presentations. The Extension Office venue worked well for us. The west parking lot was just the right size for the electric vehicle display. 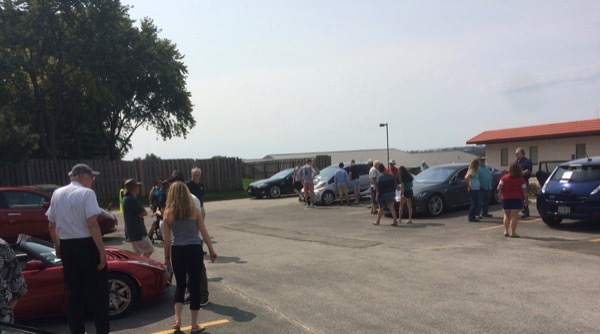 Don Cox allowed several people to test drive his Tesla Roadster. Five elected officials attended: Douglas County Cmsr. James Cavanaugh, State Sen. John McCollister representing the venue's district, Bellevue City Councilman Don Preister, Omaha Public Power District Board Mbr Craig Moody, and former Sen. Ken Haar. Visit this event to check out electric vehicles on display by their owners in the parking lot and tables inside for groups associated with electric vehicles, batteries, solar panels, charging stations, and more! · 2:25 pm - Nebraska Community Energy Alliance – Larry Burks, Bellevue Asst. Admin. Registered attendees report 472,490 electric miles driven.